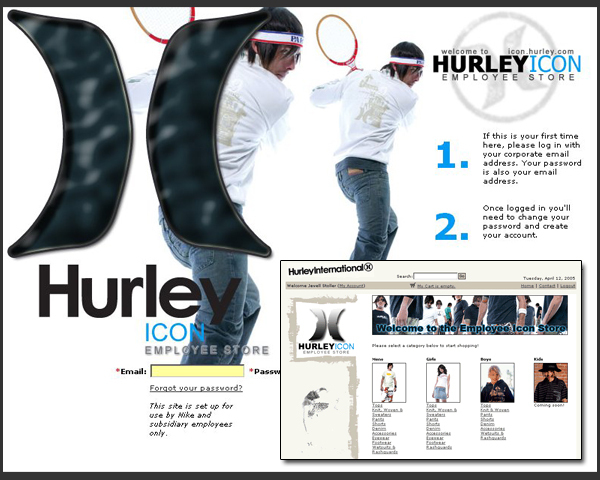 Hurley International – Website Design & E-Commerce | ASTRALCOM - Content Strategy, Conversion Marketing and Customer Acquisition. Hurley International – Website Design & E-Commerce | ASTRALCOM – Content Strategy, Conversion Marketing and Customer Acquisition. So, ASTRALCOM had a few hurdles to overcome in order to deliver the requested functionality. To begin, an authentication-based shopping cart was created that “sits on top” of the inventory where available product display is controlled through an image management system that regularly sweeps the image directories to ensure that everything is accurately displayed and accounted for. Underneath this architecture, ASTRALCOM developed a digital solution where exported inventory is imported hourly from Hurley’s legacy system into a database via DTS import, called through stored procedures. The inventory is then replenished each time between imports/exports to keep the numbers – and the online store display – accurate. If you want to start making money online, you’ve definitely come to the right place. Contact us today to and increase e-commerce sales like this for your business.